der Gerät – We are the only ones to provide the original! Alkadur RobotSystems GmbH is the world’s only provider of the doner robot ‘der Gerät’. In co-operation with German engineers and with the spirit of pioneers, we designed an ultra modern robot which is unique in the catering sector. ‘der Gerät’ perfectly prepares any kind of doner meat and even cuts it into the desired portions. Never before has preparing doners been easier, faster and above all more hygienic! 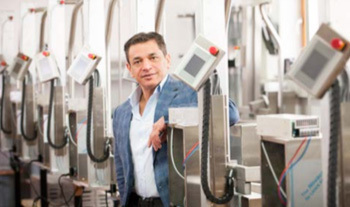 Combining more than 20 years of experience in preparing and cutting doner meat, ‘der Gerät’ has enabled us in the position to offer an efficient and convincing system to our customers. The TV show ‘TV total’ made the doner robot a star. Since ‘der Gerät’ was presented by its inventor Duran Kabakyer, the doner robot has enjoyed real cult status. In Germany as well as abroad, ‘der Gerät’ has become very popular. At international catering fairs, we regu- larly inspire our customers with ‘der Gerät’, our master- piece made in Germany. Since our responsibilities even include the fields of distribution and marketing, it is not surprising that we have been awarded the Founder’s Prize of the Schwäbische Zeitung. Our principle of first- hand consulting, marketing and distribution guaran- tees very close proximity to our customers. Duran Kabakyer, inventor and CEO of ALKADUR Robotsystems GmbH. Sensors ensure optimal preparation and portioning of the doner meat. 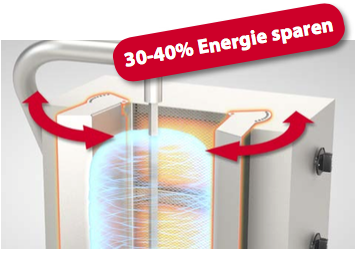 Upgrading the conventional gas barbecue helps to reduce gas consumption by 30% – 40%. 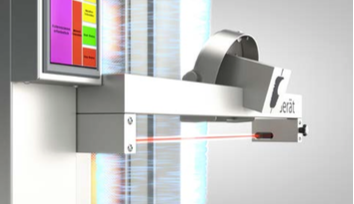 The Alkadur doner robot cuts by means of integrated optical sensors. All cutting and roasting processes are controlled by the PLC. The latest model DCR-VG2.1 is able to cut doner meat-on-the-spit with a max. diam- eter of 60 cm and a max. height of 80 cm. The weight of the meat-on-the-spit is then approx. 100 kg. Thanks to sophisticated technology, the energy consumption of the robot does not exceed 0.2 kWh. All types of meat can be cut excellently, whe ther veal, mince, chicken, turkey or mixed. It is not only because of the TV show ‘TV Total’ that since 2011, the doner robot has become the audience’s darling. But we do not want to rest on our laurels. Tech- nical perfection while continually developping our products is the goal we aim at. Trend-settting ideas on how to improve the operation and functioning of our doner robot is our basis. Innovation and state-of- the-art-technologies is our philosophy. Our latest mod- els work even more precisely, quietly and efficiently. Compared with the previous model, the new robot is equipped with a clearly organized touchscreen simpli- fying program selection. In the future, we will always be working on providing the top quality products that our customers have come to expect.